What printed materials are there available? 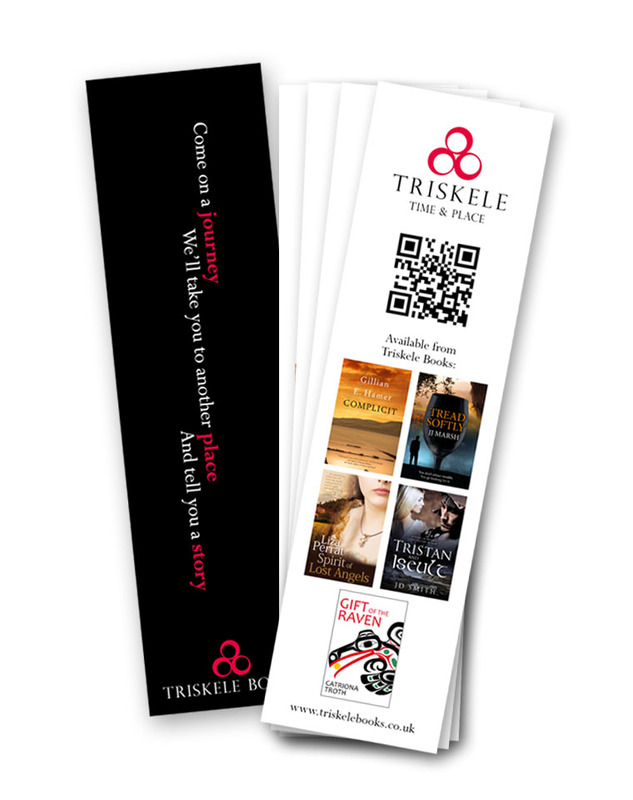 Bookmarks – these are great for including as a special extra when signing printed copies of your book, or giving out to reading groups who may be reading your novel. You might want to consider having them laminated for a longer life. Postcards/flyers – does anyone really send postcards? Probably not, so you might want to think about a flyer. The advantage over bookmarks is that you can get more information on the back of a flyer. A6 (1/4 of A4) is a great size. Posters – these are particularly suitable when having a signing or launch party to post up around the event venue either on the day or beforehand with dates of your signing on. 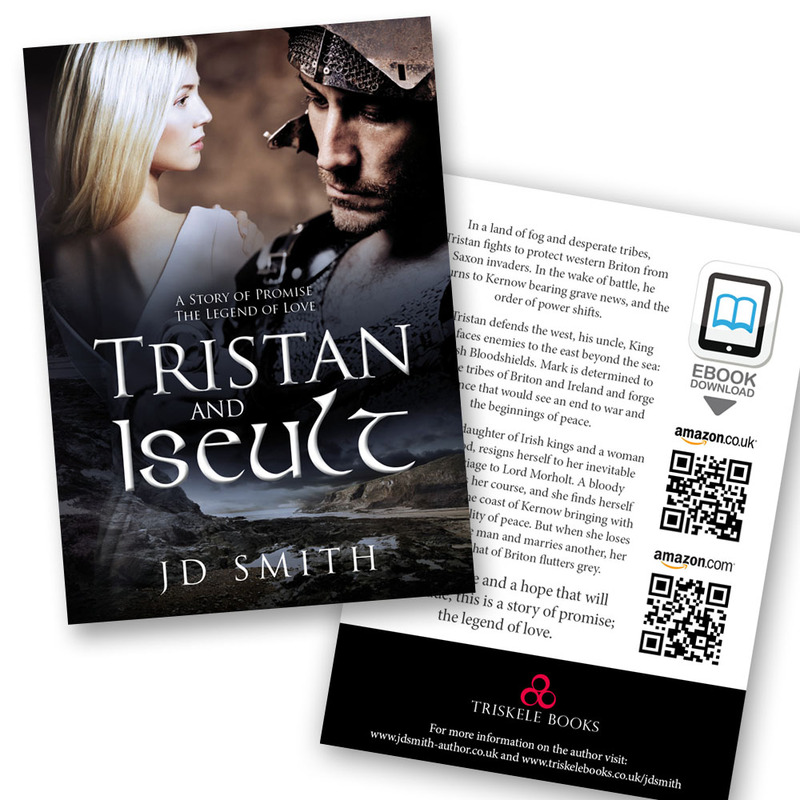 Above is an example a postcard I designed recently for my book, Tristan and Iseult. On one side I included the cover, and on the reverse I added the blurb, the Triskele Books logo, (you could add your publisher logo, be it a small publisher or your own imprint), both my author web address and that of Triskele Books, and QR Codes so that Smartphone users can zap the code with their phone and be taken directly to the Amazon.com or Amazon.co.uk sales page to download an e-copy. This is a fantastic way to promote ebook sales at live events. On the bookmark below, our Triskele Books collective joined forces to create a single bookmark we could all hand out to cross-promote our books. Not only does this mean that each bookmark given out promotes ALL the books, we also saved on print costs by bulk-printing a job lot and splitting them equally between the authors. We included our logo and strapline on one side, then on the reverse a small thumbnail of each cover, together with the Triskele Books web address. It’s worth noting that if you’re looking for something simply to ‘give away’, flyers could be your better option. You can get more information on them, you can fit your whole book cover on one side, and as an added bonus here in the UK flyers that do not have a promotion or giveaway on (i.e. enter this code at the checkout to receive 20% off) are not subject to 20% VAT (tax). Bookmarks are considered an item with longevity and are therefore subject to VAT, as are posters. It’s always worth asking your designer for a print price. As a graphic designer I am constantly searching for the best print prices, and have a working knowledge of how reliable certain printers are. JD Smith (Jane) lives and works in the English Lake District. Having worked as a graphic designer for over 12 years, her passion for books and everything literary took over and she now works predominantly on book cover design and typesetting. She is the editor of the writing magazine Words with JAM, and the author of Tristan and Iseult. I'm regularly asked for advice on what to include on a copyright page. Obviously it's not set in stone, and copyright pages vary, but if you need a template feel free to use my example below. 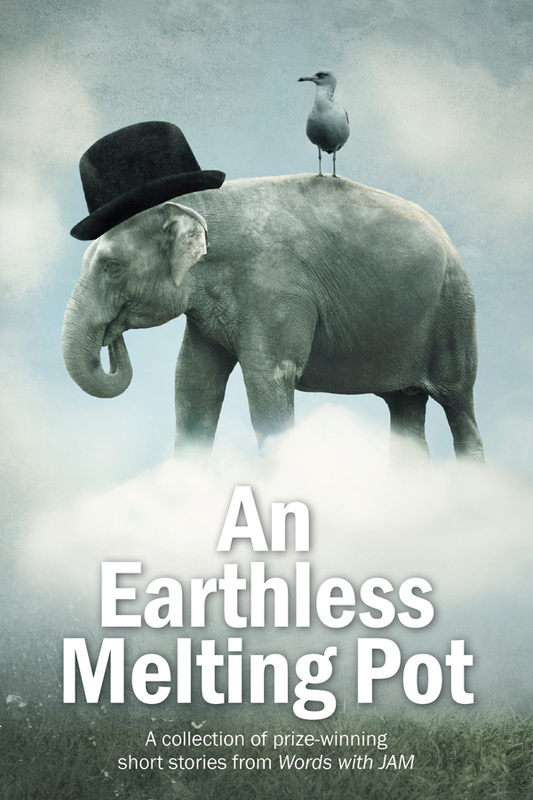 If you publish with Smashwords it's compulsory to include the title, copyright statement and your name together with the phrase 'Smashwords Edition'. I change this depending on which distributor I'm using. So for Kindle I'd change it to 'Kindle Edition' etc. JD Smith - Editor Jane lives and works in the English Lake District. Having worked as a graphic designer for over 12 years, her passion for books and everything literary took over and she now works predominantly on book cover design and typesetting. She is also part of the Triskele Books group, and is the author of Tristan and Iseult. A Rabbi walks into a bar. He has a long, long grey beard, he's wearing tzitzis, the whole package. And he has a frog on his shoulder. The bartender asks, "Where did you get that?!" The frog answers, "Brooklyn, there's loads of them there." The above joke appears in "The Aristocrats", a documentary about 'The Dirtiest Joke Ever Told'. In it, a long line of top-name American comedians tell the same joke over and over in a 101 different shades of tastelessness. In fact, Robin Williams is the only one allowed to tell another joke (the above) than the dirtiest joke ever told. I'm not going to get into the joke itself here, so you'll just have to see the film. Suffice it to say that what comes out in the film's 89 run-time minutes are some VERY dirty and disgusting variations of one single joke. What shines through, however, is the pure joy of a very short form of storytelling: the telling of a joke. A joke can take the form of a humorous anecdote. I recently heard an Australian friend retell the story of how down by his beach some municipal funny-man had replaced the R in "Rocks slippery when wet" with a C. A joke can be something you've recently read, re-told with a wry grin "Buy your mother a bottle of wine for Mother's Day; after all, you're the reason she drinks" - or take simply the form of a single line that has entered the mainstream vernacular: "Don't mention the war". "A young destitute man dreamt of inheriting from his very rich auntie. When she dies, he's dismayed to hear that she hasn't left him a penny. After all the cleaning, dusting, tea-drinking and brown-nosing he's done through the years, he's truly enraged at the dead old biddy. After the funeral, he learns that she insisted on being buried with her priceless diamond and sapphire ring on her finger. After a great deal of Scotch and brooding, one - of course - dark and stormy night, he decides to take what he believes is his. He drives out to the cemetery, digs up the coffin and unsuccessfully tries to pry the ring off. In a panic, he gets out some gardening scissors, cuts the ringfinger off and drives away with his prize. . On his way home, in the middle of a dark forest in the raging thunder-storm, his car breaks down. The man can't get his car started, and he's getting ever-more nervous, the bloody finger burning through his pocket. He starts walking. After awhile, through the trees, a far way away, he makes out a faint light. The man starts making his way through the forest. It's slow going, but in the end he is relieved to find a cosy little cottage with the light streaming out through the windows. The man knocks on the door, and a kindly old woman let's him in from the storm. The woman is vaguely familiar, but the man doesn't think much of it, as the living-room is both warm and dry. The woman offers him some tea, which he accepts. She walks into the kitchen. The man starts looking around the room, and on the table finds a jig-saw puzzle laid out, near completion. To his utter amazement, he realizes the jig-saw is an image of the very same living-room that he is in, with him standing over the jig-saw puzzle contemplating it. In the same instant the woman comes back with the kettle and cups. Things start falling into place, and he notices that the woman's ringfinger is amputated. He starts asking her "What happened to your - " when she says [here Kirsten put on a banshee SHRIEK] "IT WAS YOU!!!!" In this way, the joke's punch line becomes the surprise twist in the tragedy. In a sense, both the joke and the tragedy serve the same purpose: it's good to be alive. The joke says: life is impossible, you gotta laugh; fuckit. The tragic tale says: life is death, but we're alive to tell of others' misery, yahey! The joke is often set firmly in the present, but can have allusions to past and future (Doggy-style joke: "Three women discuss their pregnancies. The redhead says she thinks she's going to have boys, because she was on top when it happened. The brunette says she thinks she'll have a girl, as she was beneath when it happened. The blonde bursts out crying. Her concerned friends asks her what's wrong? She sobs out that she suspects she's going to have puppies.") The real-life tragic horror story often has something akin to a linear three act structure "She was in an abusive relationship for years, then finally had the courage and power to break away from her violent husband and found her true love. However two years after, she developed brain cancer and was dead within three months." The future of storytelling, you ask me? All in all, I'd say we're in pretty good shape. People have forever been, and forever will be, telling whoppers in different shades and shapes. The comedy and the tragedy, in their full format versions share these same pros and cons. Dumb and Dumber, The Hangover, Tropical Thunder basically all rely on a one line joke. A banana peel lies in the road. A man approaches. He falls upon it, then stands up - not understanding what the hell just happened - and falls on it again. Repeat. We love this repetition, because it is so stupid: thus reflecting human nature. We recognize, mirror, ourselves. Tragedy, by essence, does the same: it makes us realize the very core of human beingness. That we share laughs - and we share pain. For short; it is what makes us human. Story-telling is - when it is done well - a sharing of the human experience. The recognition of not being alone. The feeling of togetherness. Be it a novel, a film, a poem; when you chuckle in the night - together with someone, or most often alone - you know you belong to a tribe of fine human beings. Because all the hateful people have gone, and all the smart, eloquent, sweet ones, have left a long lasting legacy. Because all this history, this bravery, this strength: it's in your hand - right now. This is the past, present and future of story-telling. I kept this one fairly quiet, because up until a couple of months ago, I didn’t know if we would manage to pull it off. 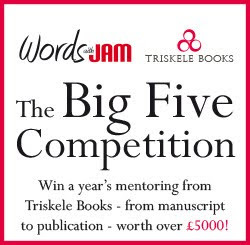 But on 1st June 2013, in association with Triskele Books, An Earthless Melting Pot – a collection of prize-winning short stories from the 2012 Words with JAM Short Story Competition was launched. Yes, we had a launch party, a real life one, containing lots of fizz and food! We kicked off the evening with primarily the fizz and plenty of chatter. I’d say we had a record-breaking 15 out of 24 contributors in attendance, but as we’ve not had launch party before, let’s just say I was astounded as such a huge turnout. Second up, Ken Elkes read Busy Lizzy, winner of the 250 word or under category. The contributors weren't the only anthology related people present; Zoe Fairbairns was bursting with excitement at getting the chance to speak to the authors whose stories she had judged earlier this year. My fellow Triskele authors chose to talk about their books in a series of brief interviews with Liza Perrat, whose book Spirit of Lost Angels was published in the first wave of Triskele releases. Gillian Hamer explained her fascination for Anglesey and why her third book, Complicit, is set on the wild North Wales coast. Jill Marsh talked about Tread Softly, her crime novel set in the Basque Country, and her research into Spanish wines. Catriona Troth discussed her novella Gift of the Raven, and how she identified with the main character's quest for his heritage. And I took to the stage once more to talk a little about my own novel, Tristan and Iseult, but this time I got a seat and also managed a laugh from the audience in appropriate places. Also in attendance and supporting the independent route, Polly Courtney, who famously dropped her publishers, Harper Collins, after their marketing her as chicklit, and became a self-publisher. Indie authors were well represented by members of The Alliance of Independent Authors, such as Helena Halme and Lorna Fergusson. But as our own JJ Marsh says, there is no Them and Us. Traditionally published authors also turned up in support and to join the fun, including Guy Saville, (a previous WWJ cover author) and Annemarie Neary. I’d like to thank everyone who joined us on Saturday, it was lovely to meet each and everyone one of you. This launch party could not have taken place without the combined efforts and funding of Words with JAM and Triskele Books – collaboration has never been more important than it is for the publishing industry today, and at 6pm, Foyles, London, England, I think we demonstrated in style what can be achieved. 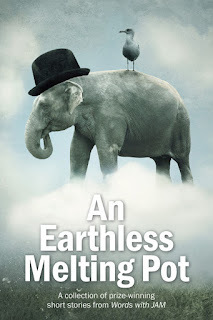 An Earthless Melting Pot is available in both paperback and ebook format from our online store, Amazon.com and Amazon.co.uk. Jane lives and works in the English Lake District. Having worked as a graphic designer since leaving school, her passion for books and everything literary took over and she now works predominantly on book cover design and typesetting. She is also part of the Triskele Books group, and is the author of Tristan and Iseult. How-to articles open up a wide range of freelance opportunities. Trade, craft, cooking, children’s, gardening, arts and many other markets are crying out for well-written articles which teach their readers new skills, or fresh ways of making use of existing ones. At first glance it might seem the easiest thing in the world to write a how-to, but unless you prepare well, you could find yourself writing in circles. You need to be able to explain the process in such a way that it is easy to duplicate, the instructions must follow a logical sequence and the right terminology be used for the readership. Above all, make sure that both you and your readers have fun. How-to doesn’t have to be boring. The beauty of a how-to article is that you get to write about topics that really interest you. Start by looking at your own hobbies and activities. Found an easier way to accomplish something that other enthusiasts could use? Discovered a new way of dealing with plant cuttings? Learned how to sole your own shoes? Made clothes from scratch – or found an easy way to cut out patterns? As you can see, the range of possible topics is wide. It’s simply a case of writing about what you know – and that is something that is hammered into all of us from the moment we decide to become writers. This style of article, more than any other, requires you to let the editor know at query stage exactly why you feel qualified to write it. This doesn’t mean trotting out a long list of academic achievements (unless they are relevant) but if every room in your home is littered with matchstick versions of the Eiffel Tower, and your spouse threatens to leave unless you start destroying some of them, then you are most likely an expert on the building of these models and should tell the editor this (but don’t mention the spouse). If illustrations are to be included (see section entitled: Picture this) you should mention this in your query letter. You need to tell your readers how to achieve their goal. Break the task down into steps. Make sure each step is easy to follow and that the instructions are not given out of order. Remember, you cannot mention anything that has not yet been covered – your reader could wind up with his corner piece glued to his widget. Choose your words carefully. Don’t suggest things; tell your readers what to do and when to do it. Important words to use are: now, next, when, then and after. Anyone who has ever watched Blue Peter will know about sticky-back plastic and toilet roll holders – for those who don’t know, think of clear adhesive tape and the cardboard inner tubes of toilet rolls, from which the clever people on Blue Peter can make anything from a jumbo jet to the houses of parliament. The reason for mentioning it here is to remind you to make a list of the tools and materials your reader will need. Make sure these are mentioned ahead of step one in your instructions. The best way to write a set of how-to instructions is to carry out the task yourself and make notes as you go along. This way you will not forget to mention the size and number of various screws, nor will you omit an important detail such as needing a number nine doodi-wotsit to put on the end terminal thingy. Which brings me neatly to terminology. If unfamiliar terms need to be explained, include a glossary, or make sure the explanation is covered in the text. For example, describing exactly what a number nine doodi-wotsit is (good luck with that one.) By the way, if a required item is only available through specialist shops, don’t forget to mention this important point next to the item on your tools and materials list. From your notes, write up a full and complete set of instructions. Occasionally, you might need to tell your reader what they should have achieved at that point. If a page of html code is supposed to bring up a row of singing daffodils, but either the flowers don’t sing, or they are upside down, it is better for your reader to realise his error and put it right before moving on to the next stage. Additionally, from time to time, you will need to explain why something has to be done. Don’t assume that because it is commonsense, or obvious to you, that a beginner will know. If all the matchsticks need to be beheaded because, with the sulphur left in place, the Eiffel Tower would be a fire hazard – say so. You don’t want someone’s house to burn down because they were too lazy to cut the matches and hadn’t realised why the instruction had been given. Some things are too complex to explain easily in words and would benefit from diagrams, or illustrations of what an item should look like at different stages. When you write your article make side notes of everywhere you battled to find the right words for clarity. Then, when you complete the next part entitled Do it again (see, I’m following my own instructions here) you can take photographs or draw the diagrams required. Your illustrations will need captions. These should be short and to the point. The information may be contained in the main body of the article, but a caption has a two-fold purpose. It saves the reader from the irritation of having to find the place in the article relating to the illustration and it can also include additional information – such as: hold grenade firmly before removing pin. As already stated (but I’m saying it again for emphasis) if you are going to include graphics of any kind, make sure to mention that point in your query letter. The next step is possibly the most important of all. Follow your own instructions as if you have never carried out the task before. Don’t cut corners, even though you’ve done it a million times and could do it in your sleep – this is to make certain that a complete beginner can achieve a result without blowing up their computer, home or spouse. So, no matter how ridiculous it might feel, follow your own instructions to the letter. What’s the point of a how-to? At the end of a how-to article your reader should be able to do something new, or something familiar in an innovative way. It doesn’t have to be anything radical, or awe-inspiring, but it does have to bring a sense of accomplishment to the person who has acted on your article. If, after following instructions, a reader is able to sit back and say, wow, I did that, then you, as author, can pat yourself on the back and say, well done, me! Not only that, the editor might say: well done! Please send more ideas. Lorraine Mace is the humour columnist for Writing Magazine and a competition judge for Writers’ Forum. She is a tutor for the Writers Bureau, and is the author of the Writers Bureau course, Marketing Your Book. She is also co-author, with Maureen Vincent-Northam of The Writer's ABC Checklist (Accent Press). Lorraine runs a private critique service for writers (details on her website). 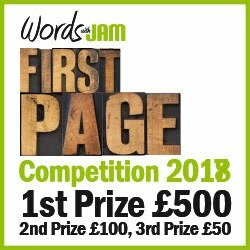 She is the founder of the Flash 500 competitions covering flash fiction, humour verse and novel openings. Writing as Frances di Plino, she is the author of crime/thriller, Bad Moon Rising. Perry McDaid sent us an interesting query on formatting: Okay, so I hate justified layouts in novels where half words carry over to new lines and hyphens exist where they should not be. Consequently, I self-published something which looked okay (left side oriented) on the A4 draft. Three points here - one a piece of advice from the damaged, the others questions. 1. Writers, for your own self-respect, check the layout AFTER you have changed to uploading format. It's amazing how a few polysyllables per line can leave your text looking like a bar chart with great wide open spaces down the right hand side. 2. What is the best orientation for a novel - Left or Justified. I’m sure many authors who intend to self-publish will be grateful for the advice. 1. Justified is the way to go. Left aligned in a book looks dreadful. In addition, justified is the industry standard. So, unless you want your books to look amateur, justify your text. 2. It is usual to format using double line spacing with indented paragraphs and no additional white lines in between unless it’s to signal a change of scene. It used to be the rule that opening paragraphs (including those signalling a change of scene) wouldn’t be indented, but it seems many publishers (including my own) no longer follow this rule, so this one is up to you. Each new line of dialogue should be indented. Karen from the Lake District gets confused over into/in to and onto/on to. She writes: I never know whether to write ‘into’ or ‘in to’ and I note that you use ‘in to’ and ‘on to’ a lot. Could you explain to me when they should be joined together and when they shouldn’t be please? Many people interchange them, but they have quite distinct uses. Into and "in to" are different. Basically into is a preposition and will form part of a prepositional phrase. With ‘in to’, ‘in’ is an adverb and ‘to’ is a preposition. But there are some easy ways to work out how to use them without needing to think about the grammar. Into is used to indicate movement, action or change. ‘In to’ can be thought of as meaning ‘in order to’. ‘Onto’ and ‘on to’ work in a similar way, except that there are many instances where both could be used and would be correct, depending on context. You need to stop and think about what it is you wish to say. ‘On to’ should be used when ‘on’ is considered to be part of the verb.